The View AR Aging area records all charges on account made by your Clients. Accounts Receivable documents can be created by Invoices, Credit Memos or Adjustments. The AR Aging record will also display payments made against the AR document. 1. Open the View AR Aging window. 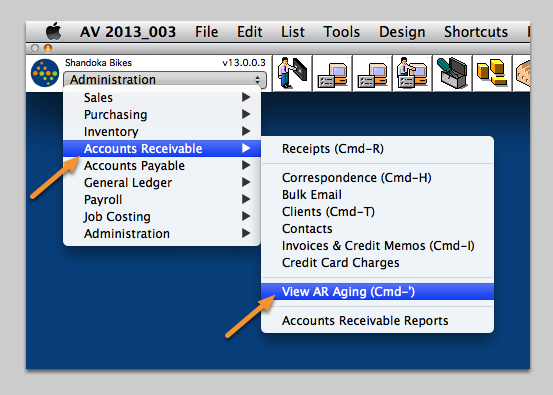 Navigate to Accounts Receivable ➤ View AR Aging. This is a read-only area. AR Aging records can not be created from this window. 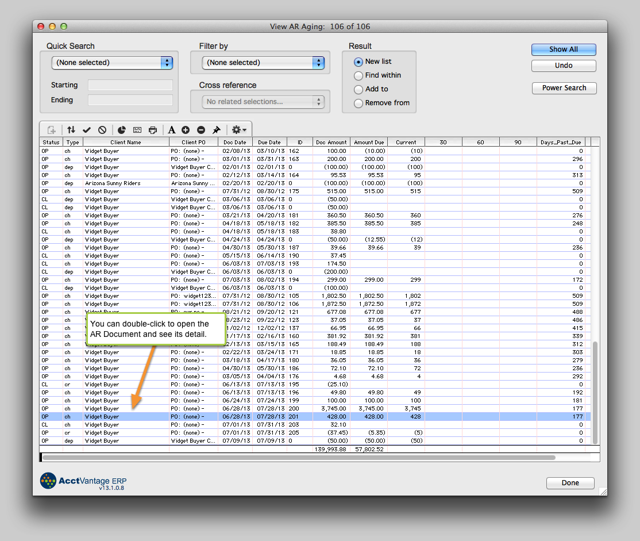 Enter the criteria for the records you want to see, then click Find. A list of AR Aging records will appear. Double-click on a record to see record details. To exit, click Done. 2. The AR Aging List View. OP: there is still a balance due on the line item. CL: the item has been paid. Client Name: The name of the company or person who owes you money. Client PO: The number that the Client assigned to the Purchase Order associated with the bill. Doc Date: The posted date of the Invoice or Adjustment record, in MM/DD/YY format. Due Date: The date by which the bill must be paid to avoid a late fee. ID: An internal number assigned to the Invoice or Adjustment associated with the bill. Doc. Amount: The original amount of the receivable. Amount Due: The amount of money still outstanding. Current: Outstanding balances that are not currently past due (usually 0 - 30 days from the Doc Date). 30: Outstanding balances that are in the first aging period (usually the first 30 days after the Due Date). 60: Outstanding balances that are in the second aging period (usually the 31st to 60th day after the Due Date). 90: Outstanding balances that are in the third aging period (usually the 61st to 90th day after the Due Date). Days Past Due: The number of days since the original due date. Zoom: The AR Aging List View. 3. 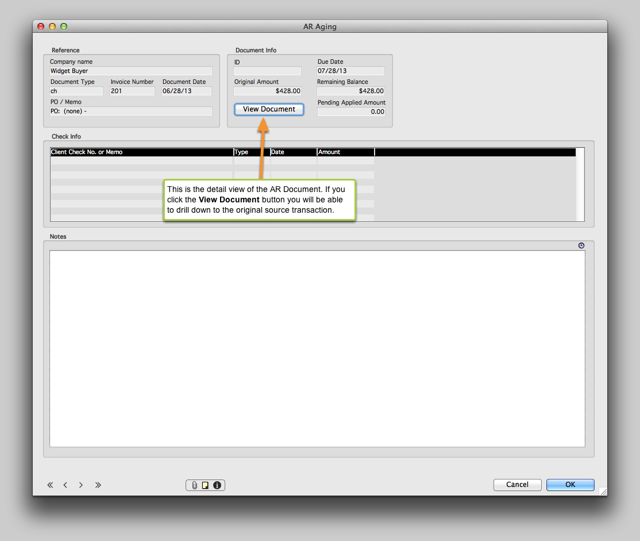 The AR Document Detail View. Double-click on an entry in the AR Aging list to see the detailed record. Fields in the AR Aging record are read-only. Click OK to exit the record. Company name: The name of the Client. Document Type: The document type which created the receivable. Document ID: An internal number assigned to the source document. PO/Memo: The Client Purchase Order number or any memo. ID: An internal number for the receivable record. Due Date: The date that the payment is due, taken from the Invoice record. Original Amount: The original amount of the receivable. Remaining Balance: The amount of money still owed on this receivable. Check ID or Memo: The check number for the payment, or a description of the check or adjustment. 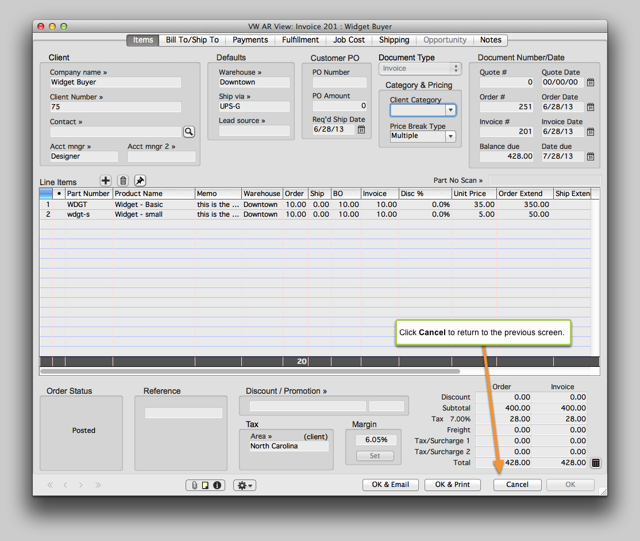 Date: The date that the check was received or the adjustment was posted, in MM/DD/YY format. Amount: The monetary value of the check or adjustment. An open text field for you to enter any notes about the AR Document. Zoom: The AR Document Detail View. 4. The original source transaction. Here is the original transaction that created the AR Document. You can email or print from this screen. Click Cancel to return to the AR Document. Zoom: The original source transaction.